Actually quite amazing to see all the things I have done, and all the spelling and grammatical mistakes. In my quest to read all the things I think I should have already read I purchased "Do Androids Dream of Electric Sheep?" It was ages ago that I last saw Blade Runner, but this book seems to take quite a different approach than the film. The first part of the book setting the scene and introducing the characters is good, the second part where the non-plot action is is good, but the last part is just weird. When I say "weird" what I mean is, deep. It gets quite religious and introspective. Not that that is a bad thing, it just does not follow the book so well. The set pieces are all there and very vivid, a destitute Mars and time ravaged Earth, different classes of humans living varied lives. I enjoyed the book and while reading it I lined up someone to lend it to, but with that last bit I am going to revisit if this sort of thing is really their thing. Recommend if you are prepared for the humanity side of things, lots to think about. I wanted to see what this little stepper motor was capable of, so I devised a "load test". The arm is fashioned out of a plastic box lid and the basket is just a bottom 3rd of a salad cream bottle. My first though was to use these buckycube magnets. Adding one at a time but I quickly added all of them and the motor happily rotated. Phase two was using one pence coins, plenty of those lying around. Which is really quite impressive for such a small motor. FYI 1 pence weighs 3.56g [source]. and I have no idea why the best performance was clockwise. In amongst the stuff I got from Amazon was stepper motor and an LCD panel. I have not looked at the LCD panel yet so its time to dig into the stepper motor. Stepper motors are quite simple once you have them working but with no idea what I was doing I was very happy to find a number of Pi enthusiast had been there before. 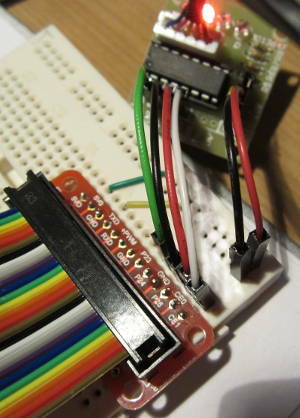 Each tutorial author had decided on a different set of GPIO pins but this one had them all nicely grouped at one end. See my build photo at the end of this post. I spent some time with this tutorial trying to get all the pins correct. But when I ran the python code the motor did not turn, strangely the LEDs turned on and off in sequence. The four LEDs light when the four electro magnets are enabled, wikipedia explains with a nice animation. Fearing the worst I turned to stackoverflow where someone else had experienced the same(?) problem. Their main culprit was the power supply. Just about to bin the whole thing as "cheap rubbish" I picked up the motor while the code was running. To my surprise the metal cylinder had a heartbeat. A small vibration each time the LEDs changed, which was every half a second. Intrigued, I started to dig more into stepper motors and found I could almost imperceptibly feel the motor ever so slowly ticking round. By changing the delay in the code I could make the motor turn faster. At a 0.001 delay the motor whizzed round in 8.5 seconds. But it would sometimes get stuck. In the code was an alternate pattern for calling the outputs, labelled "manufacturers datasheet". Changing to this greatly improved the reliability and I had no more "stalls"
I set about trying to find out how many "steps" were required to complete a 360 degree revolution. I found I had to change my delay from 0.001 to 0.01 or it would seem to skip steps and create non-reproducible actions. The first value 100 moved the arm hardly at all, the second 1000 seemed to be an exact quarter, but 4000 was not quite a full circuit. Trial and error lead me to 4100 and I found I could run my code repeating 4100 steps clockwise and then 4100 steps counter clockwise over and over again (main test was eight times) and the arm would always end up in the exact same place. It turns out that the 4100 figure is because the motor has 64 ratio gearing and if you want to get technical the correct value is 4100.22. # Takes parameters for number of steps and which direction from the command line. # To operate the motor for 4100 steps (a complete revolution) in a counter clockwise direction. 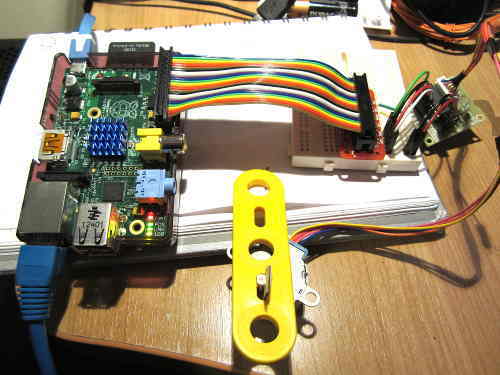 You can see the Pi wired up with my cobbler, a bread board and the stepper motor driver. The arm was a piece of plastic toy I found in the bin. It has bit of cardboard wedged in the hole to keep it tight. Here is a close up of the wiring. This USB soundcard was only £4.25 but I have wanted to try voice stuff with the Raspberry Pi for a bit and as I had a Amazon gift card, it was purchased with a load of other "stuff". Got it working very quickly. That's for Card 1, as apposed to Card 0(default). Controls in alsamixer are arrow keys, 'M' and 'ESC'. This produces VERY noisy, crackly results. Produces a much smoother/cleaner result. There are lots of examples of what to edit to make the USB card the default. I much prefer having the commands to use it when I want.